The Baths of Virgin Gorda are a geological wonder. Huge granite boulders emerge from turquoise Caribbean waters, and when seas are calm, you can snorkel among the granite rocks. These boulders are as big as a two story house. A watery trail takes you through caves beside and beneath the mammoth outcroppings, and at the end of the trial is Devil's Bay - an aquamarine marvel and an aquatic feast for the eyes. After I visited the Baths the first time, I thought that granite boulders didn't get any bigger than this. After all, these were king size rocks. That's what I thought until I did expeditionary travel in the granite fields of Central Arabia. These are the batholiths of central Arabia. They are found in the Southern Nejd Quadrangle south of Mecca Road. You drive out of Riyadh southwest for two hundred kilometers on the highway, and then head off-road due south into the desert for another two hundred kilometers. You keep driving south until you arrive at the middle granite fields where the boulders are as large as a city block and as tall as a ten story building. 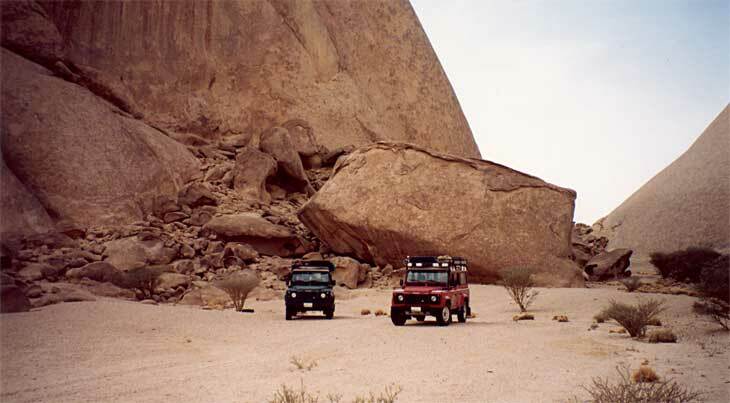 Take a look at the small red Land Rover heading for the megamammoth, overwhelmingly large granite outcrops. 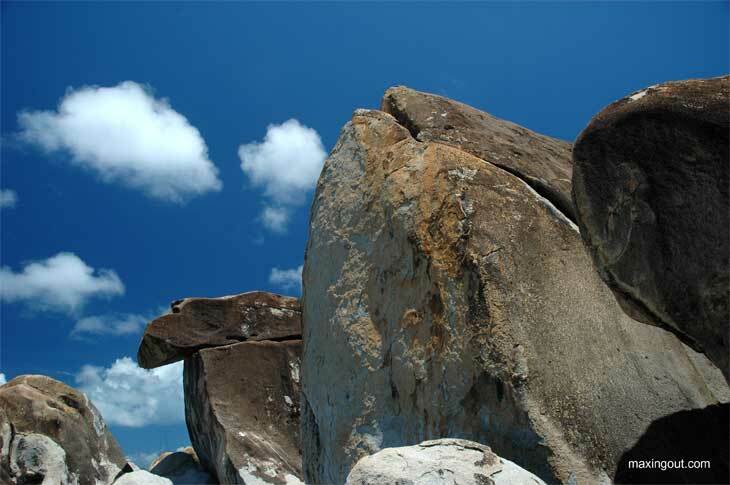 The Baths of Virgin Gorda look like grains of sand compared to these batholiths. When I first saw these chunks of granite, I couldn't believe my eyes. I didn't know that single boulders came in such large sizes - I guess that's why they call them batholiths. The batholiths stretch across the desert for hundreds of miles. I have camped dozens of nights in the granite fields of Arabia with batholiths surrounding on all sides. It's pure joy to drive my Land Rover across the desert sands at forty miles per hour traveling from one set of granite boulders to the next. Just before sunset we make our camp, lighting campfires that will cast dancing shadows on surrounding granite walls. These batholiths dwarf our Land Rovers. We are at least two-hundred kilometers off-road in this section of the granite fields, and that's the way we like it. The air is clean and there's no light pollution from the city to ruin the night sky. The Milky Way spreads from horizon to horizon and Orion spends the night watching over us as he marches across the winter sky. Camping in the granite fields does have it challenges. It's hard to drive your tent stakes into the ground when there is granite all around. Sometimes you simply set rocks on the corners of your tent and hope the tent doesn't blow away if a sandstorm comes up during the night. How I wish that I could once again be outback and beyond cruising in the Batholiths of Central Arabia. 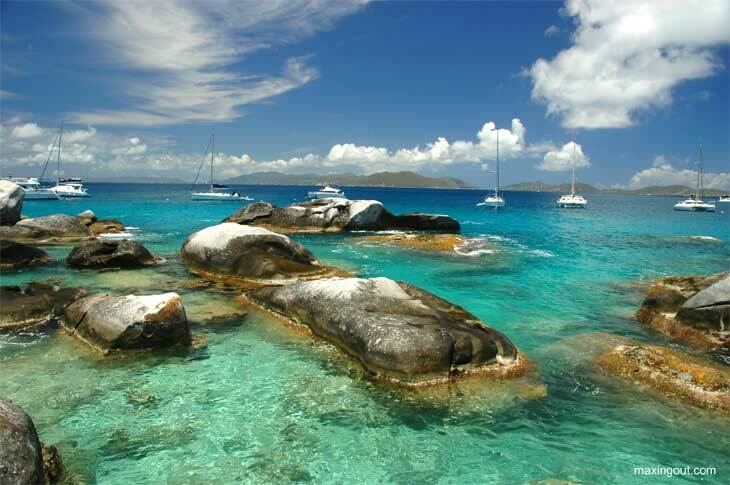 But for now, that's impossible, and I will satisfy my granite yearnings with a visit to the Baths of Virgin Gorda. Life is good.